Our brown bag lunches (bbls) take place in our atrium at the center of the office where many people eat their lunch anyway. We collect the topics in the kitchen on sticky notes on a flipchart where lots of people pass by throughout the day. This keeps the events in everyones minds and lets everybody see which topics are coming up. The bbls are Wednesdays at 12:45. Always at the same time to allow people getting used to it. On the morning of the bbl a reminder with the details is sent out via email. This email includes the presenter, the topic and a short description, plus the following text at the bottom to remind everyone why we are doing bbls and that everyone can speak at one. The purpose of brown bag lunches is to share knowledge and interesting topics with your fellow Stylighters. You have a topic you are interested in and would like to share with other Stylighters? Great. This could be absolutely anything really. The new tool you are working with or the zen in bee keeping. Whatever you are into. 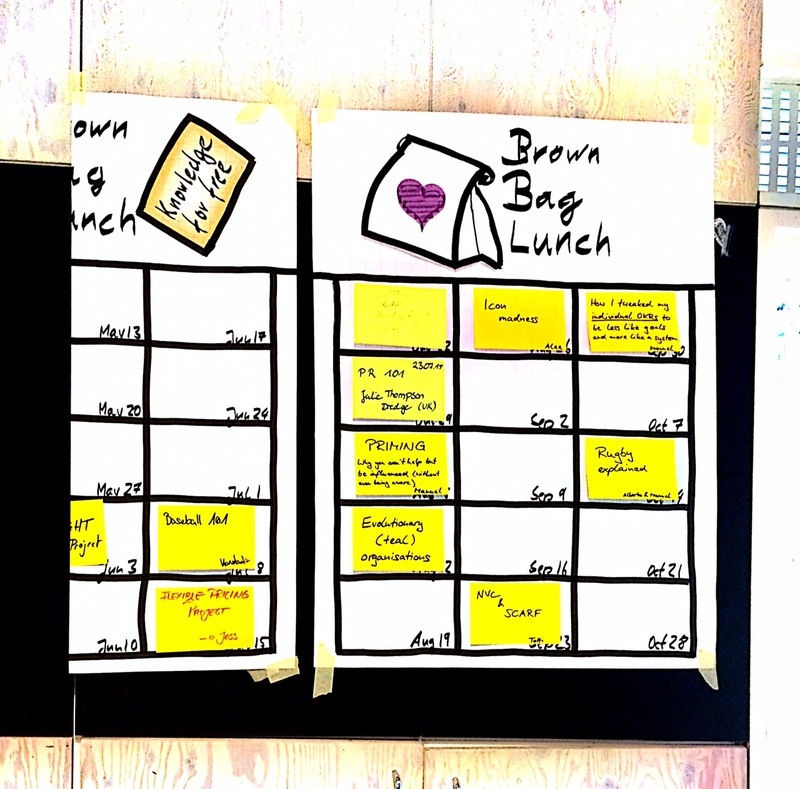 Grab a postit and put your name down for a brown bag lunch slot on the poster in the kitchen. The format is entirely up to you. You prepared some slides. Sure. You want to write on a flipchart. Great. You want to show a video. Lovely. You got a completely different approach to get your points across. Excellent. Some speakers record their bbl, some send the slides around afterwards, others don’t leave a digital trace. We leave this up to the speakers.